The GDPR gives data subjects more rights with regard to their personal data. Articles 15 to 18 and 19 to 22 name a total of seven specific rights that the data subject can exercise in order to, for example, correct or delete personal data. The data controller must respect these rights and is therefore obliged to respond to requests by data subjects. With Privacy Nexus you are able to register all these requests in one place and track their progress. 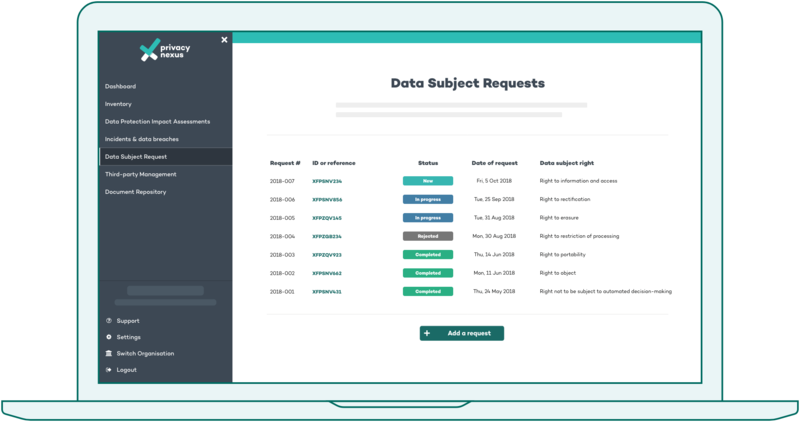 With the Data Subject Request module, Privacy Nexus offers a clear workflow to create a record of all the data subject requests your organisation has received. Register the requests with a simple questionnaire and keep track of their progress by assigning different statuses. Privacy Nexus allows you to easily categorise all incoming requests by the applicable data subject right, take notes while you’re handling the request and finally use the Dashboard to create an overview of how many requests you have received over time. Keep track of individual requests and demonstrate GDPR compliance to the Data Protection Authorities (DPA) with Privacy Nexus!